Each time a player has completed a successful minimum of 500 Viwawa Cash top up via any of the options above, he/she will receive an Viwawa Auspicious 8 bundle! Additionally, each top up via the following options above entitles the player a chance to take part in a lucky draw dip where 8 lucky winners gets the chance to win +8 Bak Kwa in Buffet Wars! 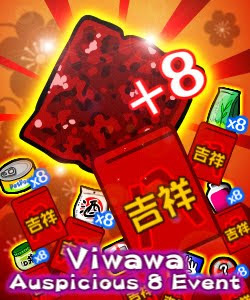 This promotion is only valid for the player by topping up their Viwawa Cash via the options as stated above from 12th January till 12th Feburary 2011. The bundle will be awarded immediately after the top up is successful. Winners of the +8 Bak Kwa will be informed seperately by 18th Feburary 2011. Hurry and top up your Viwawa Cash now! what does the "stand a chance to win +8 bak kwa" means? "Additionally, each top up via the following options above entitles the player a chance to take part in a lucky draw dip where 8 lucky winners gets the chance to win +8 Bak Kwa in Buffet Wars!" It's a lucky draw chance. New Wahjong Awards and Statistics! Viwawa Sushido Harvest is now a No.1 free app! New Wawa emoticons. Download for free! Wahlords Monster Bash & Healing Totem Updates!